On 6/20/17 we had our final Capstone share in front of parents. The day before, 6/19/17 we had a share in front of classes. I presented my Capstone in the auditorium. But this is how the day went, first we made our entrance and parents took pictures and such. Then we sang our songs “Nothing More” by The Alternate Routes and we sang to the tune “Don’t you worry ’bout a thing” by Stevie Wonder but we made up our own lyrics with the other classes and with the help of Ms. Bescherer our music/chorus teacher. After we sang, we sat down and watched a slideshow of pictures with a picture of us in Kindergarten and a picture of us in 5th Grade. Then we sang the school song “We are the Future of the World” written and composed by my music teacher Ms. Bescherer. We met up with our parents and set up for Capstone. I had nothing to do in the auditorium so I got my business cards and handed them out with my friends who were also performing in the auditorium. We finally started Capstone and we started with our first person Apollonia and she did her Capstone on Axolotls. 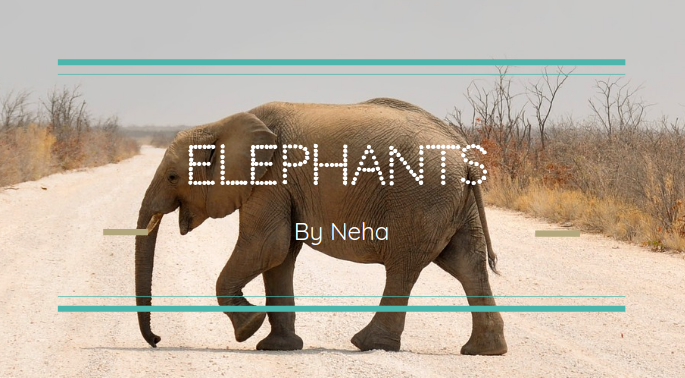 Next it was me and if you didn’t know I did my Capstone on Elephants. The third person was Corina and she did her Capstone on Giant Pandas. The fourth person is Ella and she did Genetics. Sam did his on Recording Studios, Abby did hers on the musical Hamilton, Nate did his on Solar Flares and lastly Lana did hers on Dreams. During I presented I noticed that I messed up some words. I was so embarrassed because I thought everyone would laugh but that didn’t happen. I am happy with the outcome of my presentation and it was fun! I hope I can do it again. After all of the research and answering questions, we finally get to work on our final product. We had to choose what type of presentation. The options we had were a video, Ignite, and a TEDtalk. When you do an video presentation, you can do a video or what ever but it has to be 5-6 minutes or lower. With an ignite, you have to have 12 slides with 15 seconds on each slide. With an ignite you only have three minutes to say everything. Lastly there is a TEDtalk. A TEDtalk is more of a freedom in my opinion. You get to have as many slides as you want and you don’t have to have a time limit on each slide. You also get 5-8 minutes to say whatever you want. With these options I went for TEDtalk right away. One reason why I chose a TEDtalk is because we did a practice Ignite to see if we were comfortable. I don’t like it because of the time limit, while I was ending a slide, my 15 seconds were up and I had to say the ending quickly then jump on to a different topic. With an TEDtalk we can say anything we wanted between 5-8 minutes. Another reason why I chose a TEDtalk is because of the amount of information I had to say. My notes were four pages long. We also did a mini Capstone share. Only one person did an ignite, 17 TEDtalks, and seven videos. I did a script for my TEDtalk. My script was easy but tough at the same time. I kept on getting more ideas and organized it on my script. But most of my script was based off of my essay and organizing it in a orderly manner was hard. The things in my script that were the most hard was the conclusion. I wanted my conclusion to be sorta like a P.S.A(Public Service Announcement) because my topic was elephants and how we can help them, but also clean. After finishing my script I got onto making the slideshow. The slideshow was the easiest part. I could base that off of my script and the final was pretty good. Our final project which means our slideshow and script were due 6/12/17. On the same day and the next we presented all of our final presentations to our classmates and our teacher. I wanted to rehearse again and again so I don’t do anything wrong because I was nervous. Once it was my turn I hesitated a lot. After I finished I was relieved. I got some positive feedback and some negative. I am happy that I did well considering I hesitated but I liked the negative feedback too because now I can improve my presentation skills and when I present again, I will do better.